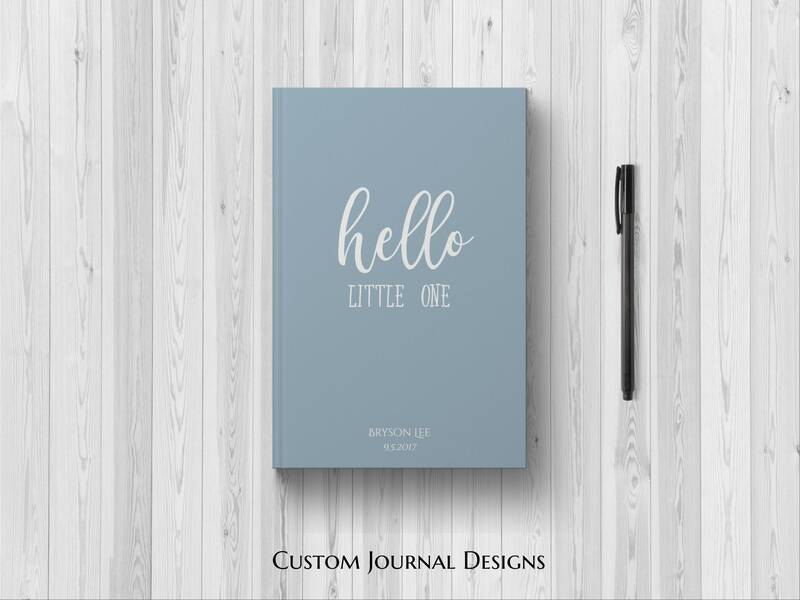 The perfect PERSONALIZED "Hello Little One" Blue Blank Journal Keepsake Book for Boys! This modern and elegant keepsake book will capture all the wonderful memories and milestones of baby boy's first year. "Hello Little One" is the perfect baby keepsake gift to your infant son. Offers parents, especially pregnant women or new moms, a unique way to send love, support, and advice to your baby boy while you are pregnant and before the baby has arrived. Use this journal to help you reflect on this moment in your life and to write your own letters to your soon to be born baby or to share from your own heart your special thoughts, wishes, and dreams for your about to be born baby boy. Makes the perfect, personal gift for any parent, baby shower gifts, 1st birthday gifts, new births, birthday party gifts, a mom to be gift, or any other occasion that is special for celebrating your baby son. What do you wish your parents had told you? What will you tell him? • Features the quote "Hello Little One" on the elegant, blue colored cover.